The unique effectiveness of LibForAll’s “Musical Jihad” program has been validated by renowned security experts and international organizations, including the United Nations and the Organization for Security and Cooperation in Europe, and has been featured in numerous blue-chip international media outlets including CNN, the Wall Street Journal, Rolling Stone, Time, the Washington Post, the Sydney Morning Herald and Serviam magazine. 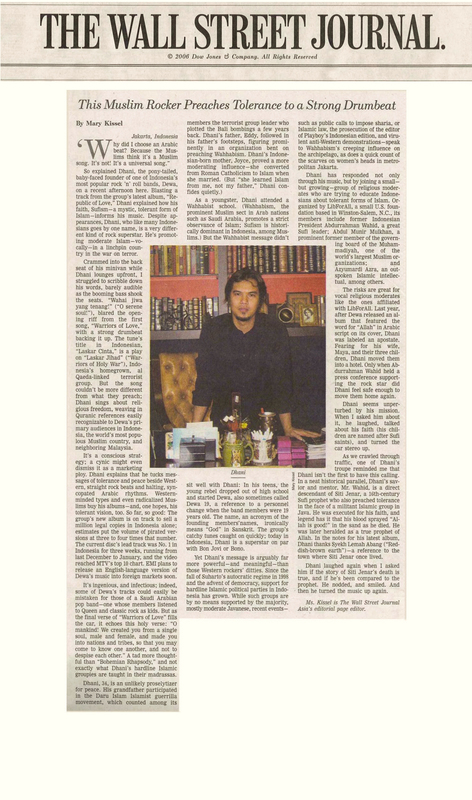 “To the millions of Indonesian youths who sell out his concerts, Ahmad Dhani is a superstar who has commanded the nation’s rock scene for more than a decade. “But the charismatic leader of Dewa, one of Indonesia’s top bands, isn’t just any entertainer crooning about the heartaches of romantic love. 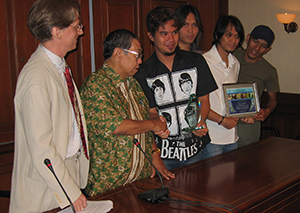 Dhani is an ambassador for peace, using his music to lead Indonesia’s youth away from radical Islam. “This week, the Muslim rocker was in the United States to share his message of religious tolerance with an entirely different audience: top U.S. government and military leaders at a national conference on homeland defense. “Dhani, 34, says attacking the ideology that motivates terrorists is the key to suppressing radical Islam. “With a longtime acquaintance, former Indonesian president Abdurraham Wahid, Dhani spoke to the group on Tuesday about a long-term strategy to combat religious extremism.” Read the full article (PDF). No to the warriors of jihad! Yes to the warriors of love! “Dhani and his group are on the front lines of a global conflict, defending Islam from its fanatical hijackers. In a world all too often marred by hatred and violence committed in the name of religion, they seek to rescue an entire generation from Wahhabi-financed extremists whose goal is to transform Muslim youth into holy warriors and suicide bombers. For every young Indonesian seduced by the ideology of hatred and fanaticism – including those responsible for the recent, awful attacks in Bali – countless others see through the extremists’ web of lies and hatred, in no small part thanks to the visionary courage of people like Ahmad Dhani. For as they listen to Dewa’s music, the hearts of millions of young Indonesians have been inspired to declare: ‘No to the warriors of jihad! Yes to the warriors of love!’” Read the full article (PDF). 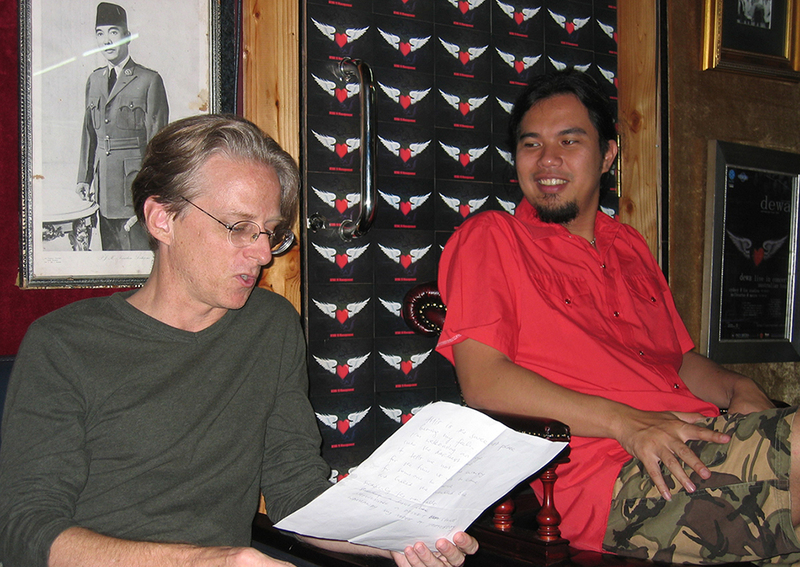 Ahmad Dhani in his studio in August of 2004, discussing the lyrics of a song for Dewa’s latest album (then being recorded) with LibForAll CEO C. Holland Taylor. The album title, Laskar Cinta, means Warriors of Love. “Crammed into the back seat of his minivan while Dhani lounges upfront, I struggled to scribble down his words, barely audible as the booming bass shook the seats. “Wahai jiwa yang tenang!” (“O serene soul!”), blared the opening riff from the first song, “Warriors of Love,” with a strong drumbeat backing it up. The tune’s title in Indonesian, “Laskar Cinta,” is a play on “Laskar Jihad” (“Warriors of Holy War”), Indonesia’s homegrown, al Qaeda-linked terrorist group. But the song couldn’t be more different from what they preach; Dhani sings about religious freedom, weaving in Quranic references easily recognizable to Dewa’s primary audiences in Indonesia, the world’s most populous Muslim country, and neighboring Malaysia. 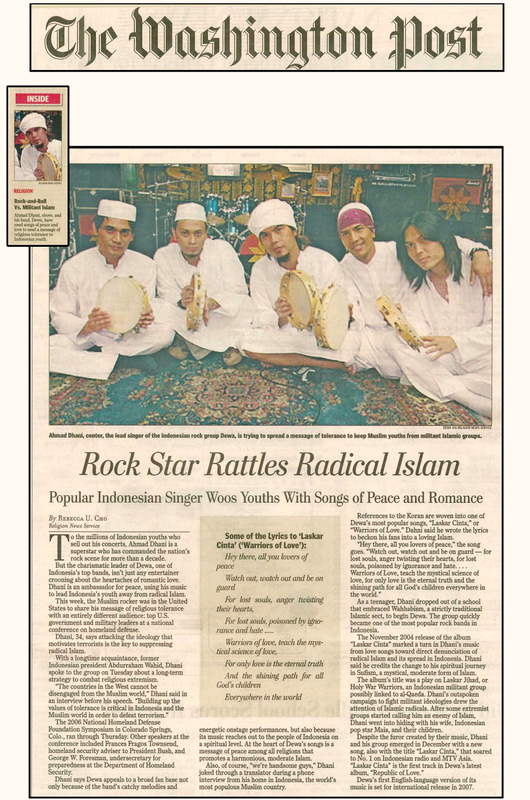 “Dhani has responded not only through his music, but by joining a small — but growing — group of religious moderates who are trying to educate Indonesians about tolerant forms of Islam. 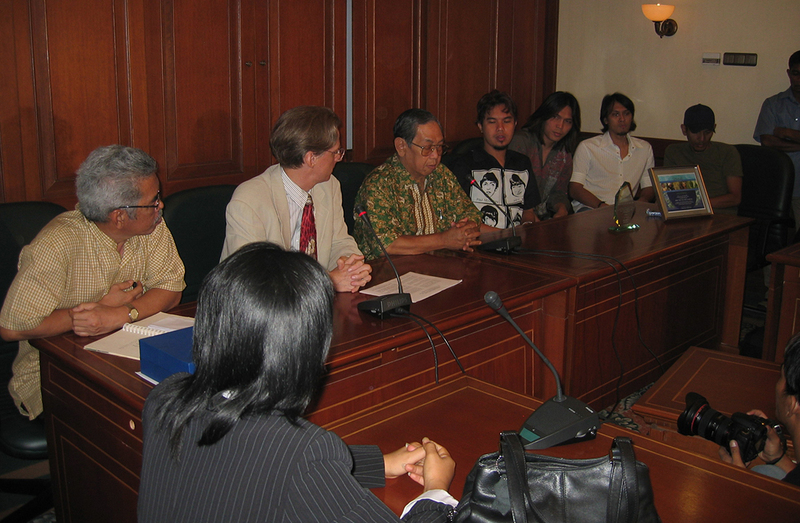 Organized by LibForAll, a small U.S. foundation based in Winston-Salem, N.C., its members include former Indonesian President Abdurrahman Wahid, a great Sufi leader; Abdul Munir Mulkhan, a prominent former member of the governing board of the Muhammadiyah, one of the world’s largest Muslim organizations; and Azyumardi Azra, an outspoken Islamic intellectual, among others.” Read the full article (PDF). 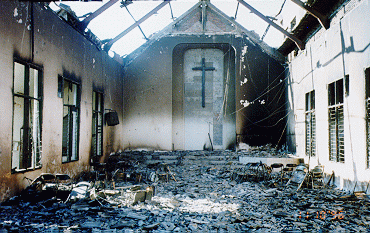 The words “Laskar Jihad” mean “The Warriors of Jihad.” It’s also the name of a radical group responsible for slaughtering thousands of Christians in the Indonesian provinces of Maluku and Sulawesi after the fall Suharto, and for having driven nearly half a million others from their homes. Asked by a reporter why he had called his new album Laskar Cinta, Dhani replied, “To fill the emptiness of Laskar Jihad, and spread the virus of [spiritual] love among the young generation.” Laskar Cinta quickly rose to the top of the charts, as millions of young Indonesians eagerly embraced its message of love, peace and tolerance. “Fearing for his wife, Maya, and their three children, Dhani moved them into a hotel. 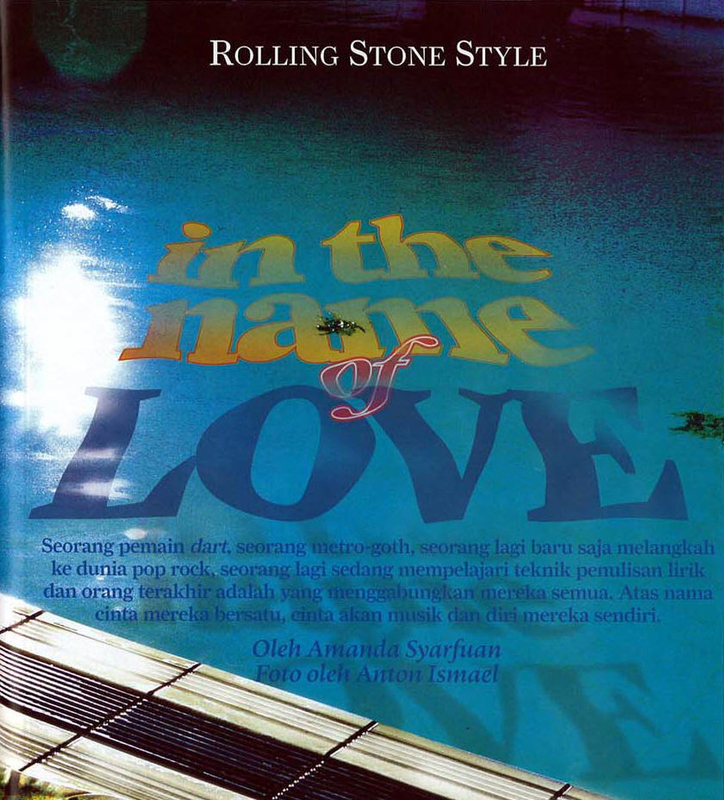 Only when Abdurrahman Wahid held a press conference [at the headquarters of the Nahdlatul Ulama] supporting the rock star did Dhani feel safe enough to move them home again. “Dhani seems unperturbed by his mission. When I asked him about it, he laughed, talked about his faith (his children are named after Sufi saints), and turned the car stereo up. “As we crawled through traffic, one of Dhani’s troupe reminded me that Dhani isn’t the first to have this calling. In a neat historical parallel, Dhani’s savior and mentor, Mr. Wahid, is a direct descendant of Siti Jenar, a 16th-century Sufi prophet who also preached tolerance in the face of a militant Islamic group in Java. He was executed for his faith, and legend has it that his blood sprayed ‘Allah is good!’ in the sand as he died. He was later heralded as a true prophet of Allah. In the notes for his latest album, Dhani thanks Syekh Lemah Abang (“Reddish-brown earth”) — a reference to the town where Siti Jenar once lived. 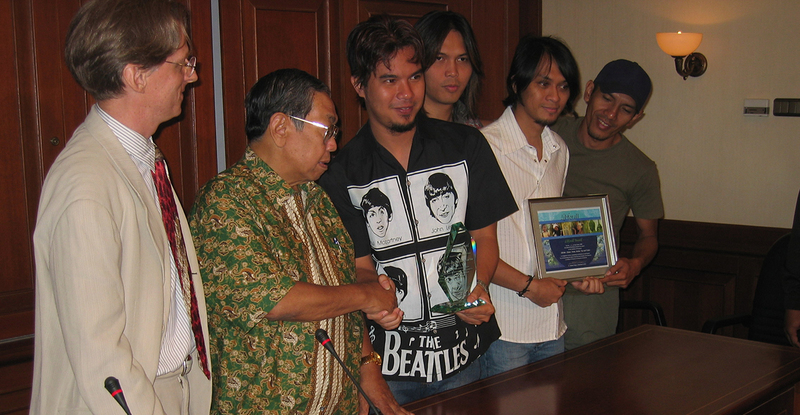 The Wall Street Journal was referring to a heavily-publicized LibForAll Award ceremony held at the Nahdlatul Ulama headquarters in Jakarta (photo, left), at which Abdurrahman Wahid and Abdul Munir Mulkhan of the Muhammadiyah jointly defended Ahmad Dhani and Dewa’s freedom of artistic expression and the integrity of their religious views. Several dozen journalists attended the event, including virtually all of Indonesia’s television networks, which broadcast coverage of the award to tens of millions of viewers nationwide. The message conveyed to the public was that in the eyes of the world’s leading Islamic organizations—and the international community at large—Ahmad Dhani and Dewa represent all that is best in the Indonesian tradition of religious tolerance and diversity. Presenter: The meeting between Dewa and Holland Taylor took place in the headquarters of the Nahdlatul Ulama and was witnessed by Kyai Haji Abdurrahman Wahid [aka Gus Dur]. Since the tidal wave of criticism [from religious extremists] fell upon Dewa, Gus Dur has been one prominent Islamic figure who supports the group without reservation. President Wahid’s support demonstrated the effectiveness of theologians and rock stars working hand-in-hand to promote a pluralistic and tolerant understanding of Islam. 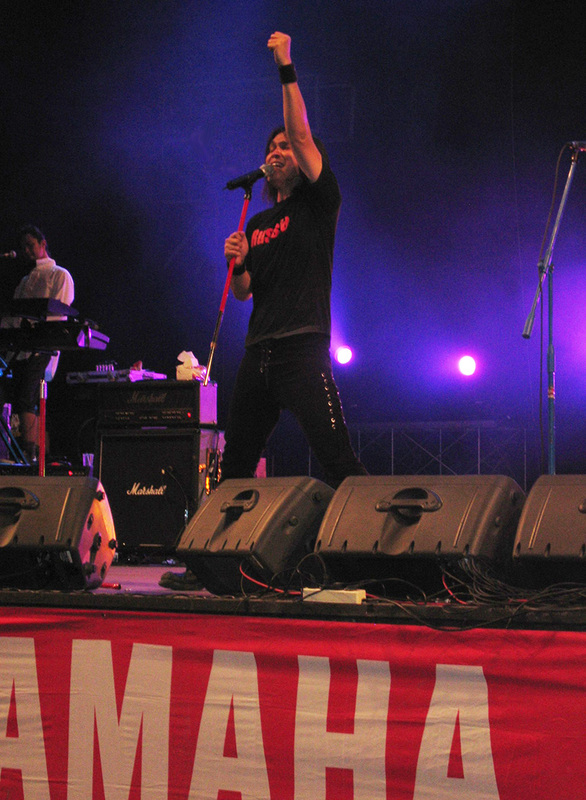 Rather than retreat in the face of extremist threats, Ahmad Dhani went on to compose a new song called Laskar Cinta (the previous album did not have a title track), using lyrics inspired by the Qur’an and hadith (sayings of the Prophet Muhammad) to denounce religious hatred and terrorism. 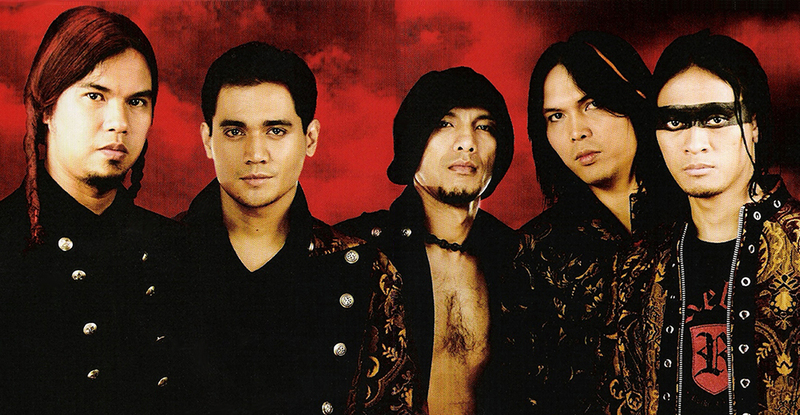 Warriors of Love became the #1 song in Indonesia upon its release in December of 2005, while its music video soared to #1 on MTV Asia’s hit program Ampuh in March of 2006. The headquarters of the world’s largest Muslim organization—the Nahdlatul Ulama, with nearly 40 million members—was the site of an awards ceremony and press conference held on Friday, June 17, 2005 in Jakarta, Indonesia. H.E. Kyai Haji Abdurrahman Wahid—Indonesia’s first democratically-elected president and longtime head of the Nahdlatul Ulama—hosted the event. Also present, as moderator, was Dr. Abdul Munir Mulkhan, Vice-Secretary of the world’s second-largest Islamic organization, the Muhammadiyah. 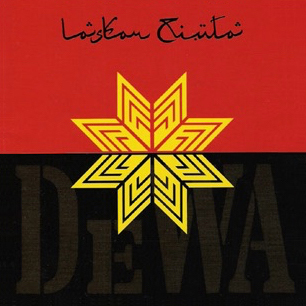 Inspired by Faiz (Ahmad Dhani’s spiritual advisor and a Sunni Muslim)—who conceived the original idea of Laskar Cinta—the members of Dewa deftly employed popular culture to disseminate a spiritual and progressive interpretation of Islam in the world’s most populous Muslim nation. Their songs continued the venerable Sufi tradition of worshipping God through profound love poetry, set to contemporary music. Like the Diwan of Hafez, their lyrics are open to multiple interpretations—either as praise of the earthly beloved, or a call of longing to the Divine. Lyrics by: Ahmad Dhani & Faiz M.
Second after second, each following the next… as the minutes fly past. The days keep slipping by… month after month as well. The constant cycle of age after age… This life, too, is bound to end in death. Because I’m the Divine Prince of Love. Night after night yields to dawn… as morning turns to midday. Passing years dissolve into the flow of centuries… all that is young must grow old. The seasons are constantly changing… This life, too, is bound to end in death. Destined to become many tribes and lands, no two of them exactly the same? Rather than turn into murderous demons, with our bloody arms raised to the sky?